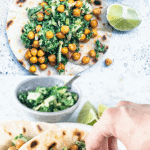 Crispy Chickpea Tacos. And that’s not all. They are accompanied by a delicious Kale Slaw, and a perfect Tahini Dressing. 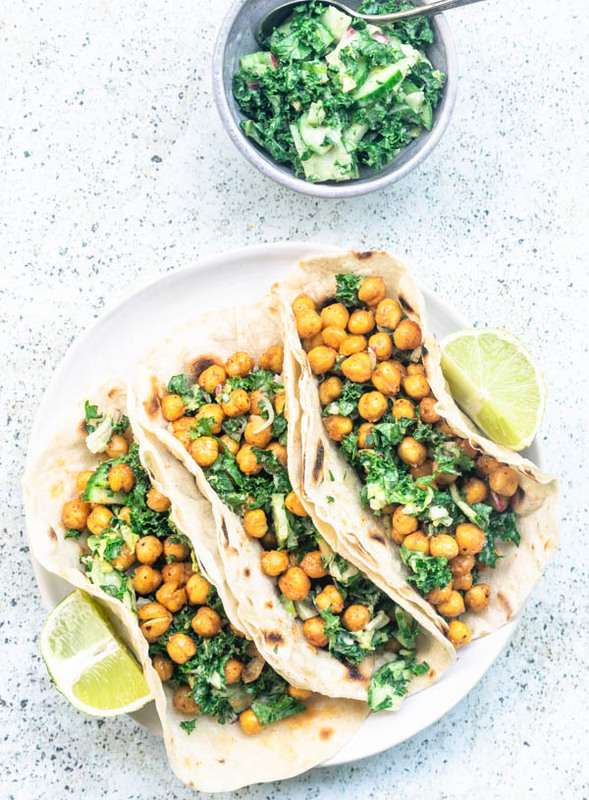 These Vegan Crispy Chickpea Tacos are the best ever! Yes, they are vegan! And drool worthy. It was hard to stop snacking while I was photographing, not gonna lie. Crispy chickpeas! One of the best snacks in the world! Totally super delish! Listen, make sure to take the skin off the chickpeas for crispier results! Skinning chickpeas can be a very monotonous task. Stick with it. Put some music on, or a podcast, which is my favorite thing to do. We are podcast people around my house. 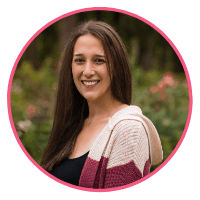 From Food Blogger Pro to Joe Rogan Experience (excellent podcast! Joe is my favorite! ), we always have something on. And cartoons, we have cartoons on. All the time. Anyway, the method for making Crispy Chickpeas is pretty straight forward. After you skinned your chicks, coat them in olive oil and salt. Bake for about 30 min. You can add spices and seasonings if you’d like. This time I kept it simple and added some hot paprika, black pepper, garlic powder, and chili powder. You can feel free to add whatever fancies you. Just make sure that you add seasonings after you remove the chickpeas from oven, because otherwise your spices might burn, and have a bitter taste. For the Kale Slaw, you can use all sorts of different veggies, for texture, color, and flavor. The recipe is calling for 5 cups of veggies. I added 4 cups of thinly sliced kale, 1 cup of shredded Napa cabbage, 1/2 cup of thinly sliced cukes, and 1/2 cup of shredded radishes. It tasted perfect to me. The Tahini Dressing was pretty damn tasty too, if I do say so myself. Overall, these were dreamy tacos! I want to make them over and over again! I always go the homemade route. I have here three recipes that you can check out. One for regular Flour Tortillas, one for Sourdough Tortillas, and finally, Spinach Tortillas. Lately, my go to has been the sourdough version. I have a sourdough starter, and I like to use it regularly because I have to feed it anyway. Anytime you feed your sourdough starter, you have to discard a portion of it. I usually discard everything but 100 grams of the starter. And then, I’ll feed this remaining starter with 100 grams of water, and 100 grams of flour. Which makes this a 100% hydration starter, since the amount of water in the starter equals the Total Flour Weight. So, anywho… Give my homemade tortilla recipes a try! Or make another recipe, but trust me, homemade will always be more delicious! I guess that’s it for today! Have a marvelous one! 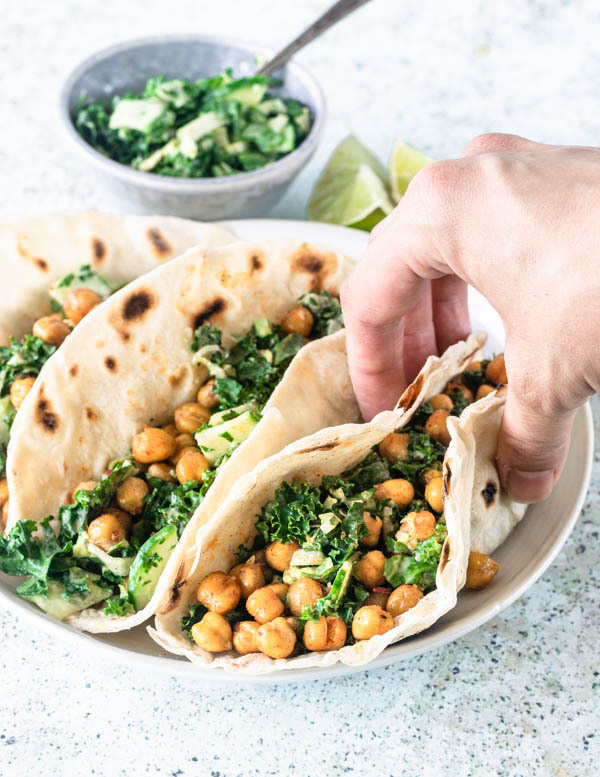 These vegan Crispy Chickpea Tacos with Kale Slaw and Tahini Dressing are out of this world! Light, crispy, and fresh! The flavors are amazing! Simple ingredients in a brilliant combination. Whether you are cooking your chickpeas from dried beans, or using canned chickpeas, have in mind that it’s an important step to remove the skins of your chickpeas, if you would like really crispy results. If you are using canned chickpeas, drain and rinse the beans. Lay them on a clean towel, fold the towel over, and scrub them gently. This step helps the skins come off easier. Removing the skins from the chickpeas might take some time, but it will be totally worth it. Place skinned chickpeas in a sheet pan. Coat them with the olive oil and salt. Don’t add the other spices just yet. The reason for that is because they might burn and become bitter in the oven. Trust me. I’ve been there. Bake chickpeas in the oven for about 30-45 minutes. Once they start to brown and their skin is looking golden crispy, remove them from the oven. Then, you might add the other seasonings. I like to add paprika, black pepper, garlic powder, and chili powder, about 1 teaspoon altogether. Crispy chickpeas will stay crispy for only a day or so. They will start to lose their crispiness, but can still be enjoyed for about 3 more days, stored in an air tight container at room temperature. You may use whatever combination of veggies you’d like. I went for mostly kale this time. And complimented with some shredded Napa cabbage, some thinly sliced cucumbers, and shredded radishes. About the garlic clove, you want to make a garlic paste with it, because the raw garlic can have a really pungent taste. To make the paste, simply use a mortar and pestle, or your knife will do as well. If you’re using the knife, slice garlic thinly, sprinkle a pinch of salt over garlic. Start to chop garlic finely with your knife, combining it with the salt. Soon, your garlic will start to turn into a paste. Use your knife blade to kind of smash the garlic as you chop it. Whisk tahini, garlic paste, lime juice, olive oil, water, salt and cayenne pepper together. You want to mix the kale really well with the dressing to soften it up. Slaw will keep in the fridge for up to 2 days. Heat tortillas in a non-stick pan. Lay some slaw over tortillas. Pour the delicious chickpeas over. Enjoy! About the tortillas: I have a couple of homemade flour tortillas recipes you can check out. Sourdough Tortillas, Spinach Tortillas, and Flour tortillas. For this particular recipe I used my sourdough tortillas, which have been my go to lately. Thank you so much, Tilly!! These look really mouth watering good. I would love to give this a go. Thanks for the tips on getting my chick peas crisp. I’m super fan of vegetarian tacos. Such a clean serving of protein, plus you can eat’em any day!. Good share! Yes, me too! I’m a super fan of vegetarian or vegan tacos!! Perfect for Meatless Mondays or any day! Love all the different flavours and textures in these tacos. I can see myself putting the tahini dressing on so many different foods. Pinning this recipe! I didn’t even think about using these vegan tacos for meatless Mondays! Thank you so much my dear!! The tahini dressing is very delicious! Perfect for meatless Monday and Taco Tuesday! These look so delicious and so filling! On a side note, thanks for the pod cast recommendation – I listen to Food Blogger Pro, but haven’t listened to Joe Rogan Experience – will definitely have to check him out! Happy Friday! Meatless monday! Taco Tuesday! That’s true!! The vegan tacos are perfect for both! Thank you a lot! These look just awesome. I am loving the flavors and it’s such a great idea! Chickpeas are the best. I agree! Crispy chickpeas are delicious! Specially in tacos! Thank you Danielle! These look amazing! Chickpeas are such a great substitute for meat. They look very flavorful with the seasonings, and I appreciate the tip of waiting until they’re out of the oven before seasoning them. Thank you my dear! Yes, if you wait to put the seasoning at the end, it won’t burn and your crispy chickpeas will be delicious.. and crispy!! I’m right there on the homemade tortilla front! They are the best. I love your filling for these tacos. My son has just gone vegetarian so I will be sharing this with him. I know he is going to love it! I hope your son likes my vegan tacos! Thank you, Shelby! What a great meatless meal! 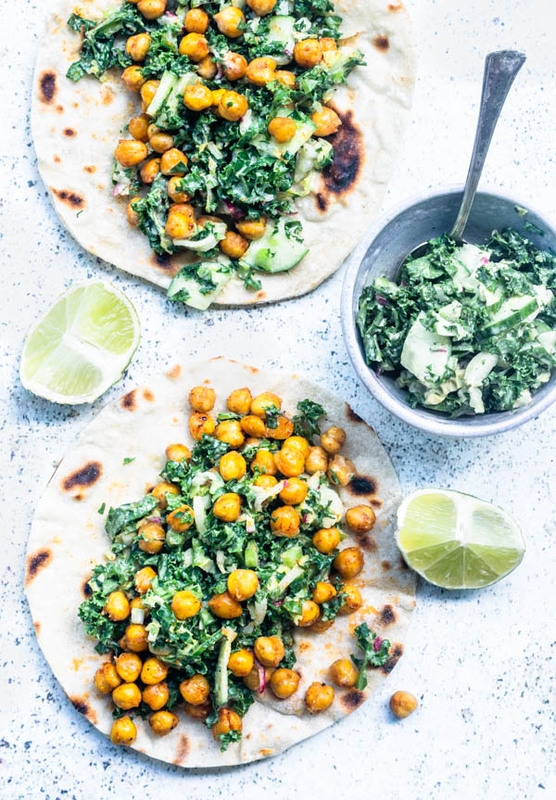 I mean you can’t go wrong with tacos and love how you made the chickpeas crispy before adding the kale salad. I would definitely be snacking all the way through this recipe just like you. And I may even get up the energy to try your homemade tortillas. Sounds absolutely delicious! Yes!! Thank you Linda!! I couldn’t stop snacking on the crispy chickpeas! Yes! Thank you Dannii!! 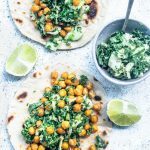 These chickpea tacos hit the spot for me! These look amazing, start to finish! Those chickpea tacos, that slaw, and the dressing!? I’d make a huge batch to put that on everything, all week long! This is a must-try for me! Thank you so much, Monica! That’s exactly what I did!! I ended up eating this for a couple days! And I was very upset when it was over lol! Chickpeas are the best!! Thank you!